3 hours – The Best Sunset Tour in Maui! The Best Sunset tour on Maui! 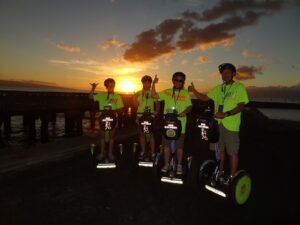 Enjoy the picturesque Hawaiian oceanfront sunset while you glide through on a Segway PT. End your day in the paradise on a perfect note while watching the sunset. Great tour for couples as well as for the whole family, for its tranquility in the intoxicating scenery.